The Mott family cemetery is a small 30 ft. x 50 ft. plot in the woods 450± feet east of Mott La., 200± feet south of Bond Lane. It is untended and not easily found. Currently only two gravestones are identifiable, Smith Mott and Sarah Mott. Unless immediate conservation measures are taken, this burying ground will likely be lost within the next generation through neglect and encroachment. 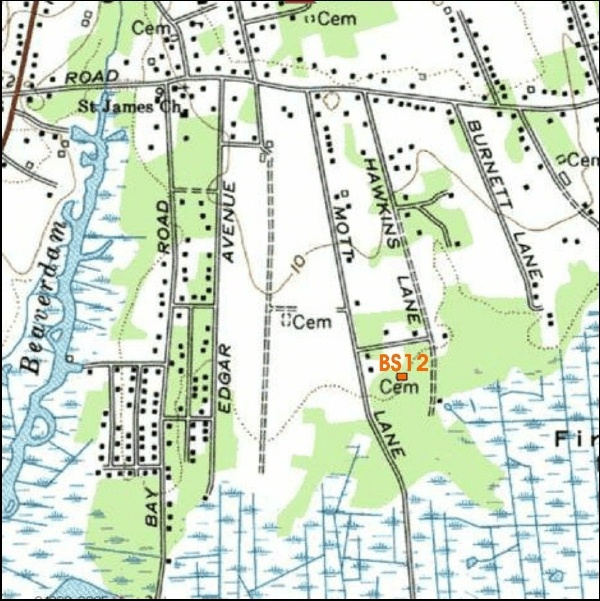 This site is identified as #S12 on the Town of Brookhaven Historian's supplemental cemetery inventory, has a Suffolk County Tax Map ID of 200-978.40-01-17.1, and has Historic Site ID Br26.3-S. Its global positioning coordinates are Latitude N40° 45.933' and Longitude W72° 54.417' as determined from USGS maps.